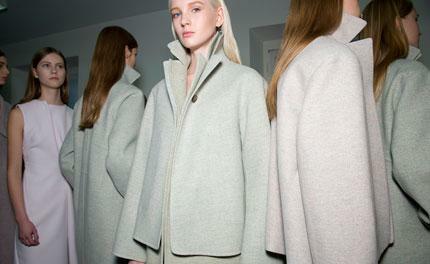 As Jil Sander continues to conduct its ongoing search for a new creative director, the in-house design team is charged with carrying on the flame of the house's founding designer. For pre-collections that is a non-issue but for the runway, where a kinetic sort of energy is required to inspire viewers in a live audience, it can present more of a challenge. Certainly all of the clothes we saw on this Winter runway were beautifully cut and crafted, doing justice to the twin pillar trademarks of this purist-minded brand. They featured Sander's signature clean lines, but were softly updated with tucks across shift dress fronts, or in the new longer dress shape that was taught across the hips but loose around the chest. The palette was a range of deeply muted pastels, as if only a drop of sea green, lavender or pink grapefruit had been dropped into a pool of white ink. As a whole, the collection was subtle, soft and at times lovely. But we look forward to the days when a Jil Sander show jolts us out of our seats into the wonderful surprises of avant-garde design.